Compare Jogging Strollers: BOB Revolution FLEX or Baby Jogger Summit X3 ? Mom with Jogging Stroller in Action! Choosing a stroller could be a difficult task for new parents as they come in many styles and with different features. But for active people who like running or hiking and who wish to keep their outdoorsy and sporty lifestyles after they become parents, a jogging stroller is the most appropriate choice. These strollers are designed to keep your child comfortably seated in the stroller while you enjoy your outdoor activity. They come with most of the features found on full-sized regular strollers such as reclining seat, storage space, canopy, snack tray and cup holders. But most important, they have only three wheels which allow parents to run or walk with more ease while pushing the stroller. Large inflated rubber tires, a stable and lightweight frame, and full suspension allow you to run on trails or maneuver on the uneven streets of the city without shaking too much your child while he enjoys a comfortable ride. Compared with other types of strollers, jogging strollers often display a more aerodynamic design for the benefit of more serious joggers. They are also equipped with rear wheel locks to prevent the stroller from moving when parked. Finally, some come with a safety strap that can be attached to your wrist, which will prevent the stroller from escaping. Note that jogging strollers should only be used with babies/toddlers older than six months. Three wheels with inflated tires that are wide and sturdy for use on a variety of surfaces and which allow parents to run or walk with more ease while pushing the stroller. Swiveling front wheel that fully rotates allowing good maneuverability while turning corners. Ability to lock the front wheel in a forward position for increased stability when jogging or when the terrain turns rough. Rear wheel locks to block movement of the stroller when parked. Adjustable suspension system with shock absorbers to provide the child with a smooth comfortable and safe ride. Padded harness with fasteners that can be tightened to keep the child secure. Padded and adjustable reclining seat that tilts back so the child can rest comfortably when falling asleep during a long walk. Fast and easy mechanism to set up and fold down the stroller. When folded, the stroller should acquire a compact size for convenient storage and transport. Accessories such as hood, snack tray, cup holders, etc.. If no accessories are provided, there should at least be an accessory adapter so you can buy and attach the various accessories to the stroller. Compatibility with car seats for parents who would also like to use their car seat in the stroller (with or without a car seat adapter). Adequate storage space for bottles, snacks, clothing, small toys, wallets and keys. This article will describe and compare jogging strollers BOB Revolution FLEX and Baby Jogger Summit X3. These were the most popular jogging strollers sold on Amazon at the time this article was written, and they come with most of the must-have features listed above. At the time of this writing, they had each received excellent reviews from Amazon customers: each had received an average rating of at least 4 stars out of 5 stars! The following table compares the main features of the two selected strollers BOB Revolution FLEX and Baby Jogger Summit X3. Please read the explanation to the tables notes that follow for a better understanding of the features. Note 1: Strollers with large and air-filled rubber wheels can be used on a variety of surfaces and allow parents to run or walk with more ease while pushing the stroller. Both strollers come with this feature. The front wheel is 12” wide and the rear wheels are 16” wide (diameter). Note 2: Swiveling Front Wheels can fully rotate allowing good maneuverability while turning corners and on difficult terrain. Both strollers come with this feature. Note 3: By locking the front wheel in a forward position, increased stroller stability can be achieved when jogging or when the terrain turns rough. Both strollers come with this feature. Note 4: Good suspension is important so that the child can enjoy a comfortable ride without being shaken too much on rough terrain. Both strollers come with good suspension. Note 5: The parking brake (also known as wheel locks) is meant for when the stroller is at a standstill, and you do not want it to roll away. Both strollers come with this feature. Note 6: These brakes are meant to be used to slow down the stroller when going downhill. 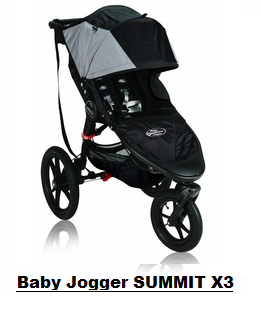 Only the Baby Jogger Summit X3 is equipped with handle brakes. Note 7: The strap is attached to the stroller at one end and is worn around the wrist at the other end. It prevents the stroller from running away while jogging. Both strollers come with this feature. Note 8: Padded 5-point five-point safety harness with shoulder pads that can be tightened keep the child secure. Both strollers come with this feature. Note 9: A padded and adjustable reclining seat that tilts back allows the child to rest comfortably when falling asleep during a long walk. Both strollers come with this feature. Not 10: BOB Revolution FLEX is equipped with an adjustable handlebar with 9 position options that creates the perfect fit for any parent's height . Note 11: This feature allows the canopy to be adjusted to block out the sun or other weather elements from child's face. Note 12: Fast and easy mechanism for setting up and for folding the stroller. When folded the stroller should acquire a compact size for convenient storage and transport. Both strollers come with this feature. Note 13: Both strollers come with adequate storage space for bottles, snacks, clothing, small toys, smartphone, wallets and keys. Note 14: BOB Revolution FLEX and Baby Jogger SUMMIT X3 strollers require a car seat adapter if you prefer to use you car seat in the stroller. See Amazon products section below for car seat adapters. Note 15: BOB Revolution FLEX Stroller is backed by a limited 5-year warranty on the frame and a limited 1-year warranty on the small parts and fabric. Baby Jogger Summit stroller has a lifetime warranty on the frame of the stroller and 1-year on small parts and fabric. If you need more information, for a detailed description of the selected strollers please continue reading below. This is on of the best three-wheel jogging strollers out there that combines a compact lightweight frame with a superior suspension system and a pivoting front wheel to provide your child and yourself a smooth and comfortable ride on all sorts of terrains. ​- Maximum child load capacity of 70 lbs. ​- Two air-filled 16" rubber rear wheels that are wide and sturdy for use on a variety of surfaces. - Swiveling 12" air-filled rubber front wheel that can also be locked in a forward position for increased stability when jogging or when on rough terrain. - Adjustable handle bar that creates the perfect fit for any parent's height with 9 position options. - High-strength aluminum alloy frame. - Wide reclining stain resistant seat that can tilt back to 70 degrees from vertical with one-hand adjustment. - Padded 5-point harness for safety and comfort of the child. - Foot-activated parking brake secures stroller in the stopped position. ​- Stain resistant, easy to clean durable stroller fabric that comes in five colors. - State-of-the-art adjustable suspension system offers 3 inches of travel and 2 stages of weight support for an ultra-smooth ride. - Extra-large UPF 50+ canopy shields your child from sun and weather. Includes a large viewing window so you can keep a watchful eye. ​- Ample storage space: 2 interior seat pockets, 1 large seatback pocket and an extra-large cargo basket under the seat. - Strap/Leash that can be attached around the wrist to prevent the stroller from running away while jogging. - Accessory adapter to attach various accessories. ​The lightweight frame folds down in two simple steps into a compact size convenient for storage and transport. The accessory adapter allows you to attach, among other things, the BOB Infant Car Seat Adapter, so you can use the stroller with various infant car seats (please refer to the Amazon section below for the BOB Infant Car Seat Adapter). The BOB Revolution FLEX Stroller is backed by a limited five-year warranty on the frame and a limited one-year warranty on the components and fabric. For exact price info or to purchase this stroller on Amazon, please click the Amazon link image in the Amazon products section below. Like BOB Revolution FLEX, the Baby Jogger Summit X3 stroller is one of the best three-wheel strollers you can get and capable of exceptional performance and maneuverability on any terrain providing superior comfort, stability, safety, flexibility and versatility. ​- Maximum weight capacity of 75 pound. - Two air-filled 16" rubber rear wheels that are wide and sturdy for use on a variety of surfaces. - Pivoting air-filled 12" rubber front wheel that can also be locked in a forward position for increased stability when jogging or when on rough terrain. Note that here the front wheel locking can be done remotely by a simple flip of a lever mounted on the handlebar. - Quick-Fold technology so you can fold the Summit X3 in one single step. - Universal accessory mounting bracket to mount with ease various accessories. - Independent all-wheel suspension system. - Rear wheel locks easily engaged with your foot. - Hand operated rear drum brakes that offer increased control on hilly terrain. - Padded seat that reclines to a near flat position in one step and a vented seat top with weather cover to increase airflow within the stroller when reclined. - Adjustable five-point safety harness with shoulder pads to keep the child safe and comfortable. - Large adjustable canopy with peek-a-boo windows and side ventilation panels. ​- Easy to clean durable stroller fabric that comes in three colors. - Ergonomic handlebar with wipe-clean grip. - Ample storage space under the stroller and behind the seat. ​The Baby Jogger Summit stroller has a Lifetime Warranty on the frame of the stroller and 1-Year Warranty on small parts and fabric. So which jogging stroller to get? Now that you have a good description and comparison of the two selected jogging strollers, you might be wondering which one to get. It is hard to choose between the BOB Revolution FLEX and the Baby Jogger Summit X3 strollers, because they both represent the best available in terms of quality, durability and features. However, note that only the Baby Jogger Summit stroller comes with hand brakes to slow down the stroller when going down a hill (but as mentioned above, this should not be a serious problem if the provided strap is used to attach the stroller to the jogger's wrist). 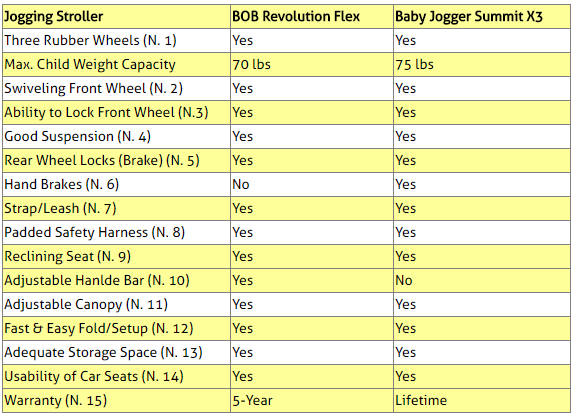 Also note that Baby Jogger Summit can tolerate slightly larger loads than BOB Revolution FLEX can, and it has a lifetime warranty as opposed to 5-Year for BOB Revolution. On the other hand, BOB Revolution FLEX has an adjustable handle bar that creates the perfect fit for any parent's height with 9 position options. With regards to accessories like trays and cup holders, both BOB Revolution FLEX and Baby Jogger Summit X3 strollers come equipped with an accessory adapter to which all sorts of accessories to be bought separately can be attached (see below in Amazon products section for the various accessories available for these two strollers). Finally, if you want to use a car seat with your stroller, note that both BOB Revolution FLEX and Baby Jogger Summit X3 strollers require buying a car seat adapter depending on the type of car seat you want to use. So, overall in terms of accessories, we can say that while these two strollers require that you spend more money for accessories or car seat adapters, they also provide more freedom and more choice in terms of accessory choice or type of car seat you want to attach to your stroller. 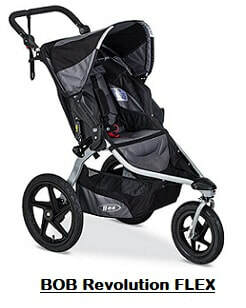 Please click the jogging stroller images below for exact price information or to purchase. Note: When you click, you will be offered on the right hand side of the screen a choice of colors to choose from. Also note that Amazon often provides a good discount on the List Price of sold products. If a discount is available, the List Price and the actual Amazon price will be shown when you click the images below.